On 15th March, Establishment General Meeting for “CHAdeMO conference” was held at Cerulean Tower Tokyu Hotel, and our Representative Keiko Yokoi who devised the name (CHAdeMO) was invited to its conference as a guest. TOYOTA, NISSAN, MITSUBISHI, FUJI HEAVY INDUSTRIES, TOKYO ELECTRIC POWER COMPANY as the organizer, and total 158 parties (Car company, Electric Power company, Charging Apparatus manufacturer, Administrative party, and so on) attended the conference. 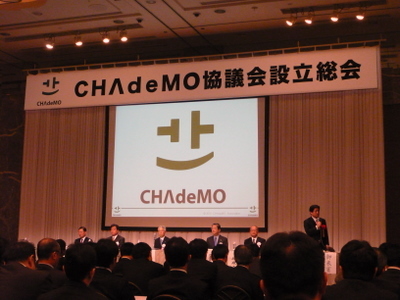 They try to standardize “CHAdeMO” for the world and work to spread the electric car (EV). Name of “CHAdeMO” means “CHArge de MOve = Move by charging” and “CHARGE DENKI (=Electricity) MOVE”. And to explain “Rapidity”, we crossed “CHAdeMO” and Japanese “oCHA deMO nondeiru aidani juden dekiru = It can be charged during drinking tea)”, and made it congenial to the people. Managing director of FUJI HEAVY INDUSTRIES Mr. Mabuchi, President of MITSUBISHI MOTORS JAPAN Mr. Mashiko, Chairman of TOKYO ELECTRIC POWER COMPANY Mr. Katsumata, Vice minister of Ministry of Economy, Trade and Industry Mr. Mashiko, COO (Chief Operating Officer) of NISSAN MOTOR Mr. Shiga, and Managing officer of TOYOTA MOTOR CORPORATION Mr. Saga.